Got out here on the island last night. Just checked emails, talked with Jeffrey for a bit and went to bed. This morning I have already put up the flags on the dock, checked a few things out at the fire house, had breakfast at Floyds and then did a little shopping at the grocery store before heading home to work on the computer. I have a community assist at 12:30pm today for the Arts Project. There big casino is this weekend and they use the fire truck to transport the big money wheels and stuff from the dock to the community house. It is HOT out here. Very sticky which I do not care much for. But I have the fans going and the breeze in the place is nice. Still have to figure out why I can not get my entire web to publish correctly. Maybe I'll work on that next week when I am at home in the air conditioning. Finally got a new URL for my site: www.CraigHollywood.com will be my new address. Have to republish everything and activate it, so the site is down right now. Working on getting this main page back up. Then will add back all of the links later. Just got done working out at the gym. Have a small gathering here tomorrow night to put my campaign material together. Also want to go over a few things on my speech with some people. Lots going on. 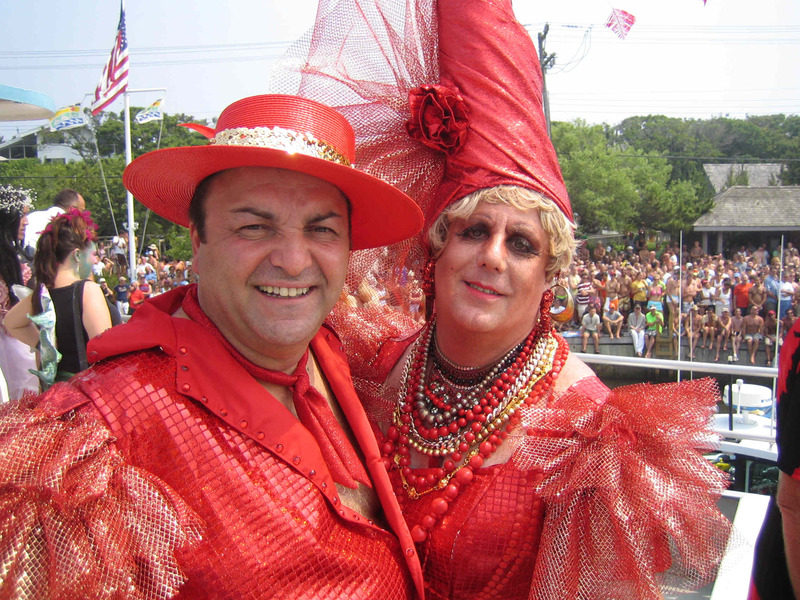 I leave for Fire Island on Thursday evening. It has been a very nerve racking day. My monarch interview / review board was tonight. I was very concerned about it but I thought it went very well. I spend over 30 minutes with 15 of our past monarchs discussing various situations and answering many excellent questions that allowed me to reflect upon my character and my dedication to the Imperial Court of New York over the past 6 years. Later I was in the Lincoln Tunnel when I received the call that I had been accepted as a candidate. I will be presented to the membership on Wednesday, August 2nd and the elections are September 6th. I have to have 50% of the vote plus 1. So the campaign has begun. Had a nice 4th out here on the island. I have been here all week on vacation. I am getting ready for dock duty. I am the dock master but only working a small amount of hours. Everyone seems to love it when I am on the dock. I normally work Friday and Saturday evenings but have been working more because of the holiday. Had a nice LP Gas drill the other night at the academy. The invasion of the pines went well this year. No rain until the day after. Yesterday was wet but nice to just relax and let me sun burn die down. 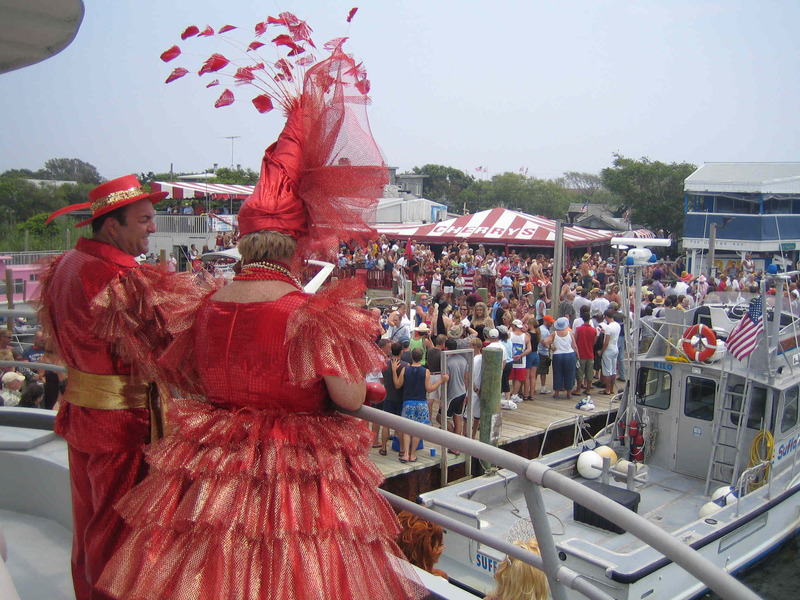 Emperor Fantasia and Empress Gefil Tefish over look the crowd before departing Cherry Grove for the annual Invasion of The Pines. Emperor Fantasia and Empress Gefil Tefish on the front of the boat over in The Pines for the annual invasion.